Mark Lawson presents a review of Jude Law in Henry V, an interview with French-Afghan writer Atiq Rahimi, and a report on the benefits and pitfalls of mixing politics with music. 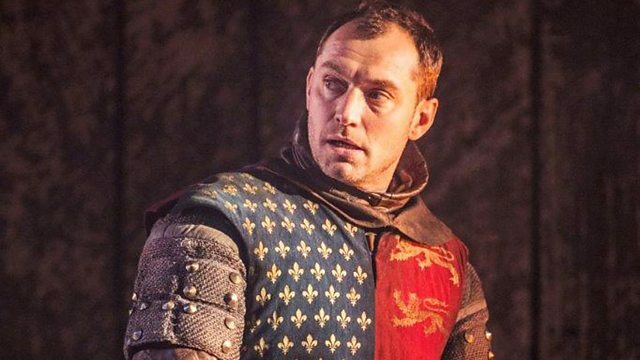 Last night Jude Law took to the London stage as Henry V in Michael Grandage's final play in his current West End season. Law, who previously played Hamlet under Grandage's direction, performs a paired-down text in a simple stage setting. Rachel Cooke was at the first night last night and gives her response. As the Shadow Chancellor Ed Balls prepares to play a 'short but difficult' Schumann piano piece at a charity event this weekend, music critic Norman Lebrecht considers other politicians who have stepped up to the mic for a musical performance. David Steel, Bill Clinton, Condoleezza Rice and Silvio Berlusconi are just a few who've performed in public, but is it always a good idea? Atiq Rahimi talks about his film, The Patience Stone, adapted from his award-winning novel of the same name. A powerful tale of one woman's resolve to break free from silence and oppression, he reveals the influence behind the story, and discusses the difficulties of turning his novels into films. The "...Up" series of documentaries, revisiting the same diverse group of children every 7 years began in Britain in 1964, with the original children reaching 56 in the most recent series. The format has also been adopted all over the world and tonight ITV broadcasts the most recent South African version, with the participants now aged 28. Gabriel Tate reviews the programme. Last night Jude Law took to the London stage as Henry V in Michael Grandage's final play in his current West End season. Rachel Cook reviews. The "...Up" series of documentaries, revisiting the same diverse group of children every 7 years began in Britain in 1964, with the original children reaching 56 in the most recent series. Gabriel Tate reviews the programme. Atiq Rahimi talks about his film, The Patience Stone, adapted from his award-winning novel of the same name. As the Shadow Chancellor Ed Balls prepares to play a 'short but difficult' Schumann piano piece at a charity event this weekend, music critic Norman Lebrecht considers other politicians who have stepped up to the mic for a musical performance.